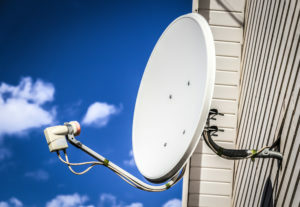 Satellite internet is an internet service type that beams data from your provider to a satellite in space, and then finally to a dish at your home. This technology is especially helpful for users who live in rural areas that don’t have wired internet services available. An internet-ready device is any device that can access the internet through the proper service. This includes your computer, tablet, smartphone, smart TV, gaming consoles, and any other internet-enabled equipment. When you use the internet on one of these devices, it sends and receives data through your modem/router. Translates data: A modem translates data so it can move between your internet-ready device and the satellite dish. You can connect some devices, like a computer, smart TV, or gaming console, directly to your modem using an ethernet cable. Wi-Fi capabilities: However, those cables can get a bit messy, and you’ll still need Wi-Fi capabilities for devices like tablets and smartphones. That’s where a router comes in. It connects to the modem to give it Wi-Fi capabilities. Update your equipment: Some modems come with a built-in router. These take up less space, but it can be easier to update your equipment if you buy a modem and router separately. Most providers will offer to lease you a modem/router, or you can buy the equipment on your own. If you decide to purchase your own, make sure it’s compatible with your satellite internet provider first. The next step in the relay is your home satellite dish. This dish must be precisely positioned to beam signals to the provider’s satellite in orbit and receive information back. A certified technician from your provider will take care of placement for you. The tricky positioning of a satellite dish can make satellite internet difficult for traveling RVs. Additionally, your account is set up to be under a specific spot beam from the satellite in space, so how far you would be able to travel and still get internet would be somewhat limited. Roughly 22,000 miles above the surface of Earth, the spacecraft used for satellite internet hold position over the equator. They rotate with the planet, so the signal relay stays consistent. This allows for two-way data communication between your dish and the provider hub, or NOC. Both HughesNet and Viasat have their own satellite with spot beam technology. Spot beams cover specific areas of the US, rather than using one beam to cover the entire country. Thanks to spot beams, you can access your individual content on the internet, instead of being sent the same thing as everyone else. Whenever you request information from the internet, whether you’re clicking on a link, streaming a show, or opening Facebook, the data from that request is uploaded through the above relay. The satellite then beams that request to the NOC. Using a much larger satellite dish than the one you have at home, the NOC receives your request. The NOC then taps into the internet backbone, gathers the information you requested, and sends it back through the relay to you. All of this process, including beaming information 22,000 miles into space and back twice, happens in fractions of a second. Because the information has to travel so far, you may notice more latency (also called lag) than you might with DSL or cable internet, but advances in technology have made the satellite internet today much faster than it used to be. Which Satellite Internet Provider Should I Choose? Viasat (formerly Exede) and HughesNet are the two satellite internet providers in operation today. Viasat has faster speeds and higher data allowances, while HughesNet offers more affordable packages.